The scene of the incident yesterday. 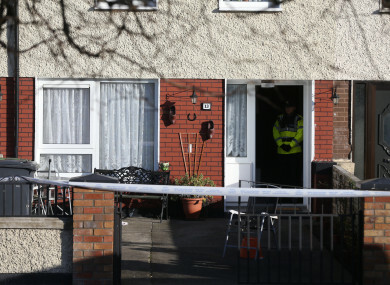 A MAN ARRESTED in connection with the killing of a woman at her home in Clondalkin has been charged this afternoon. Mother-of-three Cathy Ward was found with serious injuries believed to have been inflicted with a knife at her in Clondalkin, west Dublin, on Thursday night. The incident happened at a house on Greenfort Drive, where gardaí responded to a call-out at around 12.30am on Friday morning. She was pronounced dead at the scene and a man in his 50s, who was known to the victim, was arrested. The man appeared before Dublin District Court this afternoon charged in connection with the case. It is understood that investigating gardaí are treating this as a domestic incident and are not looking for anyone else in connection with the woman’s death. South Dublin mayor and Sinn Féin councillor Mark Ward said the killing was “another devastation visited on the area of north Clondalkin”. The arrested man is being detained at Lucan Garda Station under Section 4 of the Criminal Justice Act, 1984. Separately, a post-mortem is due to be carried out on the body of David Lynch (42), who was shot dead as he walked out his front door in Foxdene Avenue in Clondalkin at around 2pm yesterday afternoon. The gunman fired at least two shots at Lynch. He died almost instantly as he was shot in the head. Email “Man charged after mother-of-three killed in Clondalkin ”. Feedback on “Man charged after mother-of-three killed in Clondalkin ”.